Individually or in combination, coconut oil and olive oil are natural treatments to promote healthy hair. Both fight dryness, with a coconut oil treatment being particularly effective in preventing frizz. Research in a 2003 issue of the "Journal of Cosmetic Science," said coconut oil penetrates deep into the hair shaft and, when used as a pre- and postwash treatment, also protects hair from protein loss, which can lead to hair damage. 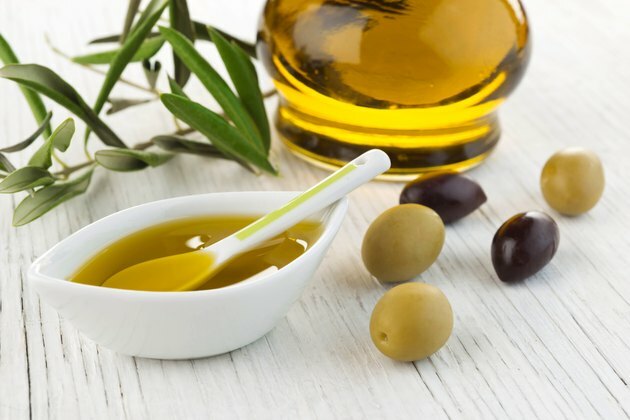 Adding olive oil to the coconut oil hair treatment will moisturize your scalp and discourage flakes. Coconut oil is solid at room temperature. You'll need to warm it gently -- but not too much or risk a burn -- so you can blend it with olive oil and apply it easily to your hair. Use a ratio of one part coconut oil to one part olive oil. Apply the warm mixture to your strands, wrap your hair in a plastic bag and then cover with a towel. Allow the blend to penetrate for about 45 minutes, recommends "Reader's Digest," and then shampoo.